At the Harvard-Allston meeting last week about transportation, Harvard's transportation planner suggested that streets in North Allston could have lanes that would be shared by high-speed buses and bicyclists. As a frequent bike commuter on the roads of Allston and elsewhere, I was concerned about the inherent conflict created by putting huge fast vehicles in the same space as much smaller and less protected bicycles. How much bus traffic will there be? Harvard emphasizes increased shuttle bus service in its transportation plan for its new campus. The Urban Ring's proposal for Rapid Bus Transit includes high-frequency buses in a system designed to maximize the speed of the buses. How much space does a bus/bike lane need? According to bicyclinginfo.org, Madison, WI uses 16 foot lanes to allow a clear three feet of separation between the bicyclist and a passing bus. Putting one of these in each direction on a two-way road would require 32 feet of width. Considering that Western Ave and North Harvard Street are approximately 45 feet wide, there obviously is no space for a travel lane in each direction (~10' each), on-street parking lanes (~8' each), and these bus-bike lanes. Even without on-street parking, a two-way road would need 52 feet for travel lanes and bus/bike lanes. Maybe our roads should be wider, maybe some of them should be one-way, but neither of those solutions seem obvious or simple. The Harvard shuttle bus / bicycle accident that occurred on Sunday morning is an important reminder that the safe design of our roads deserves significantly more attention. Menino - "My job is to plan the city"
The City is starting a new planning process to limit building heights along the Rose Kennedy Greenway and assess the potential impact of any new development on the North End, Chinatown, and the Wharf District. City Planner Kairos Shen says that "While the study is going on, we would probably be very conservative." While the City's Community Wide Plan for A/B North is being done, will City Hall be comparably conservative with Charlesview's project? Wouldn't it be great if Harvard sought opportunities to build housing that would make a positive, cohesive impact in North Allston and North Brighton? Harvard students have written about architecture in Allston, and a group of Harvard students proposed a Washington Allston Artspace back in 2004 but these activities haven't gotten close to putting a shovel in the ground. And considering how Harvard has refused any public role in the relocation of Charlesview this may seem like a pipe dream. But perhaps some encouragement can be taken from the example of the Yale Architecture program and the latest product of the Yale Building Project which was featured in a recent Yale Daily News story. A new home - designed and built by Yale Architecture students and faculty - was recently dedicated in New Haven. It is the 20th affordable home the architecture school has built for members of the New Haven community and the same lot will be the site of projects in 2009 and 2010. “We, as a school, hope to make a positive, cohesive impact on the King Place neighborhood,” Yale School of Architecture Dean Robert A.M. Stern said. As Barbara mentioned in comments to an earlier post, there will be a Tri-Congregational Concert at the Hill Memorial Baptist Church, 279 North Harvard St on Sunday from 4 - 7 p.m.
Allston-Brighton Councillor Mark Ciommo will be the MC for the event. The musical program will be headlining the local Boston Jazz Legend "Harvey Diamond and the Diamond Cosmos", Spanish Christian music, the break dancing of "DSC - Dangerous Styles Crew", Creole music and the World Champion "O'Shea-Chaplin Irish Step Dancers". Admission is FREE! The Silent Auction and food and refreshments will be in the downstairs hall and will be going during the entertainment. More than 100 years ago a new chapter in public transportation began when a subway car from Allston descended into a Boston tunnel. It was September 1, 1897 and Boston was home to North America's first subway system. Early in the 20th century it was possible to build bridges to connect Allston/Brighton, Cambridge, and Watertown. In 1915 the Anderson Bridge was built connecting North Harvard Street and Cambridge. In the 1920s, the Western Ave Bridge, River Street Bridge, Weeks Footbridge, BU Bridge, and Arsenal Street Bridge were built. The last bridge to be built in this area was the Eliot Bridge in 1950. Why was it possible to build so much 80 years ago? When there is so much more development planned in our future, why is there so little new transportation infrastructure being proposed? Harvard's "big ideas" are amazingly small - a new road (Stadium Way) that runs parallel to Windom St from Cambridge St to North Harvard St. and somehow getting shuttle buses across Soldiers Field Road and over the Weeks Footbridge. The City and their consultants didn't offer anything at Wednesday's meeting that seems even remotely close to easing the huge traffic problems that we have today or that we will have when 20,000 additional people live or work here. Harvard and the City don't seem to think the Mass Pike ramps should be improved, a regrettable flip-flop 3 years after writing in the North Allston Strategic Framework that we should "investigate new configurations of the Turnpike access ramps". The presentation by the City's consultants was mostly a lot of colorful, schematic arrows and broad-brush suggestions like encouraging some traffic to use Lincoln Street instead of Western Ave. "Mobility hubs" sound cool, but we have some fundamental problems (like trying to get off the Mass Pike at rush hour, to name one of many) that you aren't going to solve with an internet-enabled kiosk in Barry's Corner. It's not clear if there is anyone at City Hall is taking a strong leadership role on this subject. Transportation Commissioner Tom Tinlin made a brief speech at the beginning of the meeting and then left. Chief City Planner Kairos Shen didn't attend. The leadership from Harvard has been equally lacking, despite the fact that "Green is the new Crimson"and that, according to Harvard's President "We all have an obligation to be stewards of the environment, and this is especially true of a university community." As devout stewards of the environment, Harvard should get serious about the deterioration of urban air quality caused by vehicle exhaust that occurs on Harvard property (Harvard owns all the land under the Mass Pike tolls and ramps) and the air pollution caused by people commuting to its current and future campus. It sounds lovely when Harvard say that its Allston campus of the future will prioritize "first the pedestrian, then bicycle and transit, and only last the automobile". But after Wednesday's meeting that sounds more like an empty slogan than a serious commitment. Harvard hopes that only 40% of people will drive to the new campus, but today's reality is that 72% of Harvard's Allston employees drive to work. To get there, it is going to take a lot more than kiosks, Stadium Way, and the hope that the Urban Ring will arrive in a decade or two. Support the Presentation School Foundation and the Allston-Brighton Kiwanis Club on Saturday, September 27. The reception will feature the music of the Boston Soul Revue, cocktails, hors d’oeuvres, and a silent auction. The German International School Boston is hosting an Oktoberfest again this year on Holton St. There will be beer, bratwurst, and homemade food, fun stuff for the kids to do, and tours of the school. $2.25 to get on the Pike? The Pike is strongly considering raising the toll for passenger cars on eastern portion of the roadway by $1, increasing the cost at toll booths at Allston-Brighton and Weston from $1.25 to $2.25. Brent Whelan writes in today's Crimson about Harvard's role in the Charlesview relocation - what Harvard's role has been to date (supporting an economically segregated plan, with low-income tenants clustered on one side of Western Ave., while luxury condos rise to ten stories above the river on the other side) and what its role could be (to reopen the conversation on Charlesview, and this time take a larger view of how this relocation could benefit us all). Beyond it being likely that the list of subjects and agencies is way too long for a single meeting, we really have no idea what the meeting's agenda is, what the focus will be, what information could have been reviewed before the meeting, or anything else. Residents similarly knew little about the CWP meeting on September 10 before showing up at the meeting, and it quickly became clear that the meeting was not the best use of every one's time when we couldn't get clear answers to our questions about the terminology being used and what exactly the BRA's consultants wanted us to agree to. Prior to that meeting my requests for an agenda or other preparatory information were rebuffed by the BRA which is too bad because a modest amount of information sharing could have helped that meeting be much more productive. I still want to think that the BRA cares about community input into this planning process and it would be great to see some evidence to support that. Neighbors on Franklin Street are hosing a pro-Obama debate party this Friday. Click the link for more info. 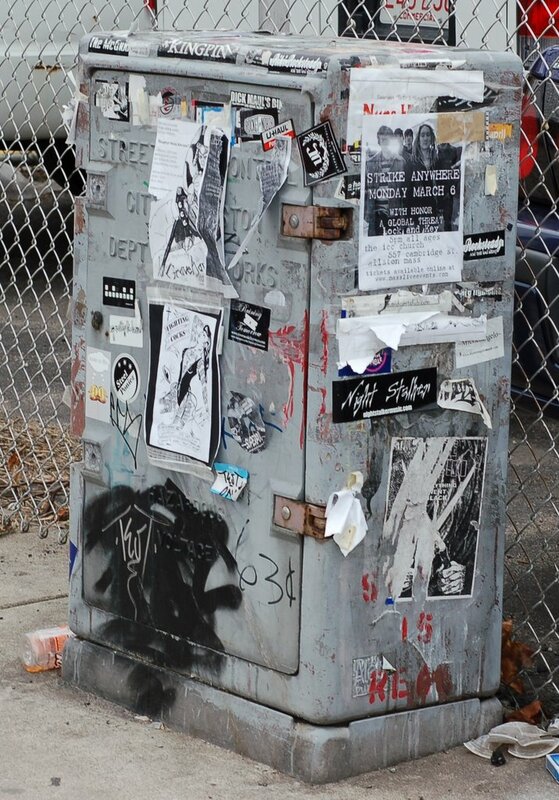 Two years ago I wrote admiringly about Stamford, Connecticut's program to turn ugly utility boxes into attractive art. It is great to see that now Boston is following suit. Boston's new PaintBox program is taking a modest first step, painting "10 boxes in neighborhoods like Codman Square, West Roxbury, and the South End." This would be great to see expanded to some of the dirty, graffiti covered boxes here in Allston and Brighton. Prompted by an email from a Brookline resident, the Globe comes to this busy Allston intersection and finds "all kinds of driving infractions, from drivers impatient to get moving zipping into the intersection and then stopping, thus blocking oncoming traffic, to others, as Roberts described, using a left turn only lane to cut ahead of cars queued up to go straight on to North Beacon Street." The Boston Transportation Dept's response is that a "left turn only" sign will be posted 40 yards before the intersection and that a traffic camera may be installed to help adjust the timing of traffic lights. Missing from the City's response is any suggestion of increased enforcement. Cambridge Police have been in Harvard Square recently giving warnings and/or citations to make Mass Ave safer for pedestrians. And I've seen police in Brookline on Harvard Ave trying to maintain some sense of order in Coolidge Corner. But I can't remember the last time I saw a Boston officer at one of Allston's several crazy intersections. These obnoxious signs are not just at Smith Field and Brighton Center. Two more were put up on Cambridge Street and its a shame that this computer software company can't restrict itself to more appropriate advertising methods. One of Harvard's largest non-Yale game crowds in recent memory visited Allston last night to watch Harvard squeak past Holy Cross, 25-24. This year's crowd was comparable to the 19,000 at Harvard's first-ever night football game last year. As the TAB reports, residents at Wednesday's Allston Civic Association meeting expressed their displeasure with the situation (when Harvard was talking about attendance of 8,000). Like most things related to Harvard, I think the community reaction is based on both what Harvard does, how Harvard does it, and the Harvard-Allston/Brighton history over the past several years. A TAB reader compares the Head of the Charles Regatta with Harvard football, but to me that is like comparing apples and oranges. If the HOCR owned acres of vacant property in our neighborhood, made a repeated nuisance of itself during construction projects, closed several stores and businesses, supported the development of an economically segregated housing project, etc., etc. then I bet there would be a lot more concern about their regatta. Instead, the HOCR comes to Allston/Brighton once a year, creates an enjoyable event for participants and spectators in Cambridge and Allston, and treats the community with modesty and respect. Boston Casting is seeking a 5 or 6-year-old girl to play Mel Gibson’s daughter in the “Edge of Darkness”. Auditions are Saturday from noon to 2 p.m. at 129 Braintree St. Girls should wear casual play clothes and must bring two current photos. http://www.bostoncasting.com/?p=285 has more info. ...BC created a sweeping plan. But city officials must ensure that it proceeds in small stages with plenty of time to correct course." RiverSing 2008, organized by the Charles River Conservancy, brings a parade, arts, and music to the Charles River on Sunday afternoon. The event starts at 4:00 in Harvard Square and moves the to Weeks Footbridge (near the Harvard Business School) at 5. Hub On Wheels, Boston's citywide bike ride and festival is Sunday. Hub On Wheels is your chance to ride a car-free Storrow Drive and it is a great way to learn more about many of Boston's neighborhoods. I know the City needs to find money wherever it can, but it isn't great to see this advertising that went up yesterday at Smith Field. I'd hope our public parks could be one place of refuge from the marketing and commercialization that pervades our society. Representative Capuano, State Senator Galluccio, State Representative Kevin Honan, and Suffolk County Register of Probate Richard Iannella are running unopposed. Why bother to vote when there is so little on the ballot? Your votes for the incumbents (even if they are unopposed) is a show of strength that signals to future potential candidates their existing support. On the flip side, if you write in someone else's name or vote blank it is a sign for future candidates that there are people who are willing to vote that might be open to supporting a new candidate. But more importantly, voting is one of the most precious rights that we have as citizens in a democracy. On your way to the poll, consider thinking about citizenship, community, and our individual and collective roles in society. In the 2006 primary, Kevin Honan got 2,174 votes and others+blank got 756. Mike Moran got 2,663 votes and others+blank got 1315. Michael Capuano got 56,482 votes and others+blank got 28,569. Update: When I voted at 8:00 this morning, I was the 6th person to vote since the polls had opened. There were 2 police officers and approximately 10 poll workers there which brought to mind some questions about how, using either the mail and/or internet, we could have more efficient and convenient elections. On September 23, the Boston Landmarks Commission will consider the proposal to add a 6 story rear addition to 1954 Comm Ave and address existing violations for the property. This will be considered by a Design Review panel at 3:00 and there will be discussion and vote at 6:00, all in Room 900 of City Hall. Obama supporters are meeting on Wednesday at 7 at the Kells (161 Brighton Ave) to organize to help Obama win here, up in New Hampshire, and everywhere else. 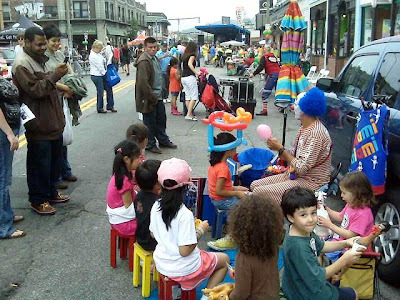 The Honan 5K (click here for results), parade, picnic at Hardiman Park, and Allston Village Street Fair were all a great microcosm of life here in Allston/Brighton. Thanks to everyone whose hard work and commitment to the neighborhood made them possible. To follow up on this post, I sent the feedback below to the BRA and their consultants. You can send your thoughts on these subjects to scecil@cecilgroup.com and Kairos.Shen.BRA@cityofboston.gov. The CWP Armature worksheet distributed at the meeting is at the ABNNF website. o The terminology in these 3 items is unclear. What is the difference between a "boulevard lined with trees", "landscaped boulevard/gateway", and "green corridor"? o Building height & style, ground floor, and upper floor uses along these roads needs more discussion, and may not be consistent for the entirety of each road. For example, there are many detached one and two family homes on Everett Street. Near the intersection with Western Ave, Everett Street has a more commercial nature. And between Western Ave and the River, Everett Street could have another character. o North Harvard St, Soldiers Field Road, and Birmingham Parkway also need to be considered. o Maybe, depends on where the truck routes would be. A regional approach is needed and should consider roads such as Greenough Boulevard in Watertown & Cambridge. o What are the impacts of intersections with more than one lane of traffic in each direction? How will pedestrians comfortably cross 4+ lanes? o Vehicular lane configuration on major roads, particularly on the two overpasses where Cambridge Street crosses the Mass Pike. Lane merges and lane shifts contribute to significant traffic backups that could be eliminated with minimal changes to the existing roads. o What is a bikeway and how is the word "route" being used in this context? In general, bikes should be ridden on our regular roads, not on special "bike only" paths. o Instead of "routes" through new developments and the Harvard Campus there should be standard public streets with sidewalks for pedestrians and, if traffic volume requires them, on-street bike lanes for bicyclists. o These crossings should not be limited to Everett and Telford. Cambridge Street, North Harvard Street, and both ends of Western Ave should also have safe and inviting pedestrian and bicycle crossings. o Better connections across the Turnpike are also needed for automobiles. These should be planned together with better crossings for pedestrians and bicyclists. o The Everett Street fork between Aldie and Adamson Street needs to be improved for pedestrians, bicyclists, and automobiles. o The connection to the river cannot stop at the end of Everett Street. It must include improvements to Soldiers Field Road and the Herter Park parking lot across from Everett Street that create a safe and welcoming entrance for bicyclists and pedestrians. o Better maintenance is also needed for the streets trees that we already have in these areas. Dead and unhealthy trees need to be replaced and young trees need more watering. o A significant number of new trees should be planted on local streets to increase the existing tree cover. Burying and rerouting overhead utility lines should be coordinated with new tree planting to provide the most benefit and create more locations where large trees can be planted. o New open space should not be limited to these uses. Larger parks and open space designed for passive and active use by adults are also needed. o A green buffer is inadequate to shield the neighborhood from the Turnpike. A solid barrier wall is needed and should be complemented by a green buffer. The existing chain-link fence should be removed after a barrier wall is replaced. Overhead utility lines should be buried as part of this project. o The design and construction schedule of Library Park should be accelerated so construction can be completed in 2009. Before construction begins, public access should be allowed to the existing grass field. o It is unclear that the current location of Smith Field is consistent with the shared vision for Barry's Corner. A more fundamental reconsideration, including a partial or complete relocation, would be appropriate. o These areas should be unambiguously public and welcoming, preferably bordering a public street on at least one side. "Semi-public" courtyards or other areas designed like the current Harvard Business School campus should be avoided. o How clustering promotes public access is not clear. An over-concentration of open space in some areas and a dearth of it elsewhere may not be desirable. o As mentioned earlier, in our urban setting "walkways" should generally be sidewalks along public streets and "bikeways" should be the travel lane of quieter public streets or bike lanes on busier public streets. o What is the proposed "range of densities"? How will increased density be accompanied by improved transportation and other services needed to improve quality of life and mitigate the undesirable consequences related to people living in conditions of greater density (noise, trash, rodents...)? o The word "careful" needs more precise definition. o New Harvard housing should contain an appropriate mix of rental/student housing and ownership units to provide a stabilizing affect for the existing neighborhood which has a very low ownership rate (20%) and high resident turnover. o Harvard wrote in its Allston Life Task Force report that " Faculty surveys suggest that faculty members are looking for a different kind of ownership than Harvard is well positioned to offer." This statement, if it is still relevant, should be more fully understood and questioned. o The need to divide retail space into "nodes" is not clear. What will exist between these nodes? o Harvard plans to create 5,000 new jobs in Allston in the next 20 years and bring at least several hundred new students to live and/or study here. 2,800 new units of housing have been proposed in North Allston/North Brighton. This growth is in addition to the existing residential population, 2,000 students at Harvard Business School, 1,000 Harvard faculty and staff at Harvard Business School and Harvard Athletics, and the people in 8,000 vehicles each day that drive on Western Ave.
o The magnitude of this population suggests that a continuous retail district on Western Ave at least from Travis Street to Waverly Street (6/10 of a mile) is a reasonable expectation. This would be comparable to Coolidge Corner and the ground-floor retail along Harvard Street between Thorndike and Vernon Streets. o What does "neighborhood oriented" mean and how is that different than "university oriented"? How can we integrate and create uses and places oriented to both the neighborhood and university instead of one or the other? o It is not clear why Brighton Mills and Barry's Corner (which are only 1/4 mile from each other) should be divided into distinct nodes. o While I am not a fan of the urban design associated with the former Kmart at Brighton Mills, it did meet many valuable neighborhood shopping needs for clothing, personal items, household goods, etc. We should discuss how these needs can be met in the future with a mix of small, medium, and large format retail. o Obviously Harvard isn't going to build museums and performing art centers only because the BRA or Allston community wants them. But hopefully, Harvard can be encouraged to return to the bold thinking in 2004 that led to Harvard's considering as much as 700,000 square feet of museums and art space in Allston. o The public orientation of these venues should be made clear. How they will serve both Harvard's academic mission and the interests of the general public? o Harvard should be explicitly included in this initiative. o This should not be limited to Barry's Corner. Instead it should include all under- utilized property in North Allston and North Brighton, regardless of owner. o The time span of "interim" activities should be clarified and these should not be a substitute for aggressively pursuing more permanent and significant uses in Barry's Corner. o The North Allston Strategic Framework identified "opening Harvard shuttles to neighborhood residents" as a possible "pre-development" activity. It should be considered in the current phase of community planning. o This seems to contradict the item above: "limit number of vehicular lanes to one in each direction"
o Dedicated bus lanes are one of many elements consider as part of a Bus Rapid Transit system (http://www.nbrti.org/) and all of the possible methods of reducing travel time for bus riders should be evaluated. The benefits and costs of dedicated bus lanes should be enumerated and quantified. o General improvements to roads that reduce travel time for all vehicles should be given priority. o The service of all local buses should be considered. Modifications to the location of bus stops has long been discussed and is one of many ways that we should attempt to improve bus service on Western Ave, North Harvard St, and Cambridge St. According to this post, the organizers of the Allston Village Street Fair have decided to not allow a voter registration table at the fair. Allston has one of the lowest voting rates around, so it would have been great to encourage people to register to vote at this popular event on Sunday. Harvard announced today that its endowment grew by 8.6% in its recently concluded fiscal year. After taking into account annual distributions to the university and new gifts, the endowment's value rose to $36,900,000,000 from $34,900,000,000. The 5th running of the Brian Honan 5K Run/Walk is Sunday at noon at The Kells (161 Brighton Ave). Online registration (which saves you $3) closes tonight at midnight at http://www.coolrunning.com/major/08/honan/. At last night's Harvard Allston Task Force / North Allston - North Brighton Community Wide Planning meeting, Steve Cecil, founder of The Cecil Group asked for consensus on several aspects of our community to enable his planning team to begin specific work on these subjects. The items, in categories Roads, Pedestrian and Bicycle Routes, Open Space and Amenities, Residential Areas, Shopping and Services, Civic and Cultural Institutions, Community Programs and Resources, and Transit, cover many important subjects and our comments and questions are essential to make sure that the work that follows is aligned with our goals. You can download the worksheet from the Files section of the ABNNF website - it is named CWP Armature Worksheet.pdf - and send it to The Cecil Group using the contact info on the page or by email to scecil@cecilgroup.com. Last night's meeting also included a presentation by Omar Blaik of U3 Ventures. Omar discussed the amazing transformation of West Philadelphia and the role of the University of Pennsylvania (where he was Senior Vice President for Facilities and Real Estate Services) as well as other progressive University/Community initiatives such as the Martin Luther King Jr. Library built and used jointly by residents of the City of San Jose and students and faculty at San José State University. This BRA press release provides some background on the Community Wide Plan. The first comment on this post asks an important question that I think is worth writing about in a new post instead of in the long list of comments that are forming on that one. The ABNNF's motivation is to have the best possible development of new housing, retail, open space, and other uses in our neighborhood. To us, this means following the best practices of modern housing design (mixed-income neighborhood housing) instead of repeating the obsolete ideas from 50 years ago (segregate low-income people in housing that isolates them from the rest of society). So our proposal is to build more than what is in the Harvard/Charlesview proposal. Specifically, we believe that more median-income and more market-rate housing interspersed with the units that comprise the current Charlesview and much more land should be used than the 7 acres that Harvard has offered. "The basic message of this report is that the educational consequences of residential segregation in metropolitan areas have profound intergenerational consequences, make a mockery of the promise of equal educational opportunity, feed the vicious cycle of racial inequality and separation, and that some very important things can and should be done to break that destructive cycle. To do them it is essential to think about housing as a key element in educational opportunity and to recognize that, far from having a true market or fair system of choice in either of these spheres, metro Boston has very severe racial barriers and boundaries that limit and threaten its future. This cycle can only be broken if it is recognized and there is a serious public commitment to integration." "Large-scale, all-very-low-income developments will always pose problems... History has shown that concentrating large numbers of very poor households in one area is a destructive policy that is to be avoided at all costs." "America’s first public housing development [Techwood in Atlanta] became America’s first genuine public housing rescue. Instead of just buying a load of new cabinets and drywall, the Authority used its $42 million federal grant to leverage another $40-plus million in private investment for a complete overhaul. In 1995 Atlanta began systematically demolishing Techwood Village and Clark Howell Homes, and replacing them with a mix of sizes, densities, and incomes that more resembles a real neighborhood. The result became a model for what would happen at Cabrini-Green, Robert Taylor, Blackwell, and dozens of other projects. The new Centennial Place contains nearly the same number of units as the two predecessor projects (900, compared to a former peak of 1,100), but they are less concentrated, with a three-tier mix of rent levels, including 40 percent of the apartments at unsubsidized market rates. But far more significant is that Centennial Place is no longer just a “housing project”—a mere agglomeration of apartments block after block—but also offers a new elementary school, a state-of-the-art YMCA, a high-tech public library, child-care facilities, and a host of employment and social services to help residents solve problems and raise their families. It has gone from being a project to being a community, part of a larger social whole." "there is no substantial relationship between neighborhood poverty changes and property values or rents when poverty rates stay below ten (10) percent. By contrast, marginal increases in poverty when neighborhood poverty rates are in the range of 10 to 20 percent results in dramatic declines in value and rent, strongly suggesting a threshold corresponding to the theoretical prediction....preventing neighborhoods from sliding past their threshold into a state of concentrated poverty would result in avoiding substantial social harms, as capitalized in dramatic losses of property values"
"The recommendations... insist that the federal role in producing affordable housing must be clear and structured to... promote mixed income housing, decommission federal enclaves of poverty..."
The ABNNF discussion about supermarket size came to mind this morning when I read this NY Times story about 10,000 square foot supermarkets that are less than 1/4 the size of the average store. This trend has been led by the British-based Tesco company with their Fresh and Easy stores in the US. The Globe gives an overview of the BC Task Force's comment on the BC Institutional Master Plan. You can read the letter in its entirety at the AB2006 website. Thanks to outside.in for choosing this blog as one of Boston's Top 5 "Up and Coming Blogs". If you are looking for some other interesting Boston blogs, check out the rest of their list. Do you care about the future of our neighborhood? Do you realize our future is threatened by the Charlesview/Harvard plan to build 400 units of economically and physically segregated housing at Brighton Mills and Western Ave? Do you realize the impact that this tall, high-density, multi-story development will have on our neighborhood? A volunteer group of concerned citizens, working with the Allston Brighton North Neighbors Forum (ABNNF), is working to address these concerns. With the pro bono help of an experienced urban planner and after more than a dozen ABNNF meetings, we have developed a set of neighborhood goals and a framework plan, creating a welcoming opportunity for the relocated Charlesview residents to successfully become new residents of our neighborhood. If you care about your neighborhood's future and want to influence change that is surely coming, we urge you to attend the Tuesday, September 9 ABNNF meeting at the Gardner School (30 Athol St) at 6:30 PM to learn how these neighborhood goals have led to the ABNNF framework plan. As has been proven in other Boston neighborhoods, when citizens speak with a consistent voice, our political leaders listen. Looks like someone sideswiped several parked cars on Coolidge Road on Friday night or Saturday morning. What a shame! Sunday on the Cambridge side of the Charles (just over the Weeks Footbridge from Allston), the Charles River Conservancy and the Consulate of Switzerland are sponsoring "Swiss Beach Day at the Charles". There won't be swimming, but there will be games, music, snacks, and information about urban swimming in Switzerland and the possibilities for having the same here in Boston. “If we get this master plan to the finish line in a reasonable amount of time, the benefits that the neighborhood is looking for can start to materialize,” he said. He also said that neighbors will have three to four months in which to vet the master plan during public hearings before the city would approve it. The University’s chief planner Kathy A. Spiegelman said that Harvrard is committed to keeping the concerns of the city and Allston residents in mind as they revise the master plan. Its not in A/B, but its just a short trip over the city/town line to the "10 Hills of Brookline Bike Tour" and hopefully tomorrow's downpours will have ended by Sunday morning. See Brookline open spaces on a Brookline GreenSpace Alliance recreational bicycle tour which will follow the path of Brookline’s 10 hills. The moderate pace on the gentle to moderate hills will be led by Ron Brown, treasurer of the GreenSpace Alliance and 14 year participant in the 192-mile PanMass Challenge. This editorial in today's Globe elaborates on my thoughts about Harvard's presence in Allston and its relationship with the nearby community. "...The independent panel should also look for clues outside of Harvard's police department. The college administration could be sending messages, subtle or otherwise, that outsiders are not welcome on campus. That would be an especially bad message to send as Harvard readies to expand its campus into the Allston section of Boston. Minorities who work at or attend Harvard have the clout and knowledge to make themselves heard. But neighbors of Harvard or passersby may not." The applicant (Harvard) shall negotiate with the Authority (BRA) and the City of Boston an agreement providing for guarantees of public access and the dedication of Library Park as publicly-accessible open space or other public use. Members of the community have asked for clarification, but have received none. Multiple fire vehicles arrived at Litchfield St this morning at approximately 8:45. The fire seems to have been contained on the 3rd floor of the building. MBTA Service Planning Unit, 45 High Street, Boston, MA 02110. Pedigreed beans (George Howell) ground and brewed in small batches make for the freshest refueling stop on the block. Zero humdrum sundaes here. Dig into exotic shaved ice, crazy mounds of fruit, and Christina's ice cream, scooped by one sweet staff. Savory a.m. chow and mule-kick libations heighten the appeal of this pub, whose sufficiently classy air keeps PJ-clad coeds at bay. Notwithstanding Allston's gobsmacking collection of world cuisines, it's still tough to beat Thai—especially when it's done this fast, cheap, and satisfying.